I think you can't possibly like driving to the village of La Jolla unless you live there. Its not the easiest destination to get to in SD county, its always so congested and parking can be a bit tough to find when fighting for spots with tourists. Nevertheless, I still make my way down there to grab some breakfast and hang out at the cove or watch the seals at Children's Beach. LH introduce us to this place a while back ago and it still stands as my most favorite place to get chicken fried steak. We usually wait till ML is in town and then head on down there but this particular weekend, EK and I had a monster craving so we made the trip down ourselves. The drive wasn't bad and parking was pretty good for a weekend- I got a spot in front of the shop! There was however a wait as usual but it was short and we were seated promptly with menus when it was our time. Did we really need menus? We already knew what we were here for but we read the menu anyways. We both ordered chicken fried steak with hash browns, biscuits and gravy on the side. Only difference in our orders were the eggs- I like scrambled and EK usually gets easy over or sunny side up. The chicken fried steak was almost everything I had hoped for as usual... moist, flavorful, crispy and crunchy on the outside yet tender on the inside. However, I feel that the portion size has been getting smaller every time I come back. The first time I came it was a gargantuan thing that dominated half the plate... kinda hard to see in the picture but now its like a third of the plate. Notice the gravy on the side- I like to cut up my chicken fried steak and biscuits and dip it into the gravy. Love the combination of textures- crispy, crunchy, tender, smooth and creamy! 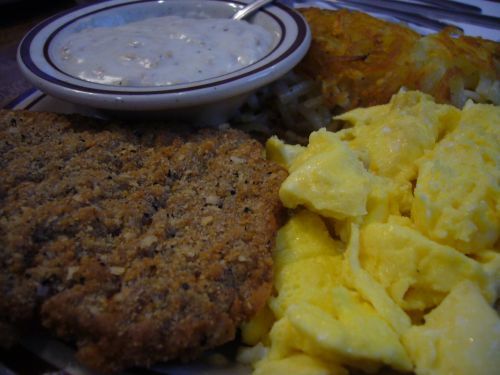 I think the chicken fried steak here is so tasty that it doesn't need the eggs, hash browns and biscuits as fillers if only it were slightly bigger but that's just me speaking. 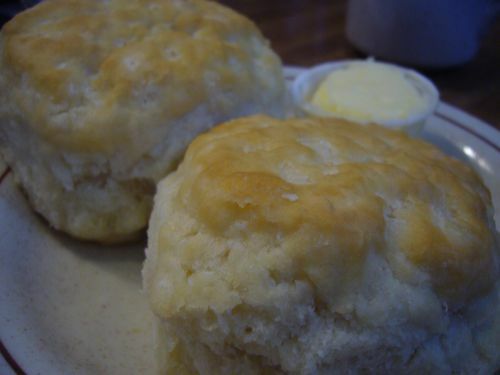 The biscuits were very warm and buttery but a little on the soft side for me. I don't remember them being this soft before- maybe they were day old on this visit? I think next time I'll ask to get them toasted as I like it nice and crispy on the outside. Funny timing! We're on a road-trip east and south with many a potential chicken fried steak encounter in our immediate future... I had no idea that La Jolla had them on offer - we should give Harry's a shot when we get back. omg yes that sounds fantastic! I'm so sure I would love a well crafted chicken fried steak, but sometimes ignorance is bliss - do I really want to get started? Never had chicken fried steak - sure looks delicious though. Have to make a point to try that! Let me know when you find a new place! Look forward to reading about the road trip... and chicken fried steak places you may be hitting up. Read FH's feedback. I think you gotta try... and you'll be hooked! Wish they had one of those in NYC. That place looks great. If I'm ever in the area I will definitely stop there. Well, rising food prices are hitting all of the restauranteurs pretty hard. The price of beef has skyrocketed. i like your blog! especially the pics. so what are your picks for san diego restaurant week? i want to take my gf to a nice place..any suggestions or is it a can't really go wrong kinda thing? I understand but I'm still dissappointed. Thanks for stoping by! Save your money and go during a non restaraunt week day. It'll be a little more pricier but well worth it. I think restaurant week is when they tend to bring out the JV team. If you're going to spend the dough wouldn't you want the Varsity team preparing it? Well I went to RW last night and it only recomfirmed my suspicions. Save the $$$ for this weekend or next week. Ooh, I like my biscuits soft. I need to hit this place up.